When was the last time you used a stitch marker when crocheting? Stitch markers are one of the handiest tools in crochet and one of the least used tools. 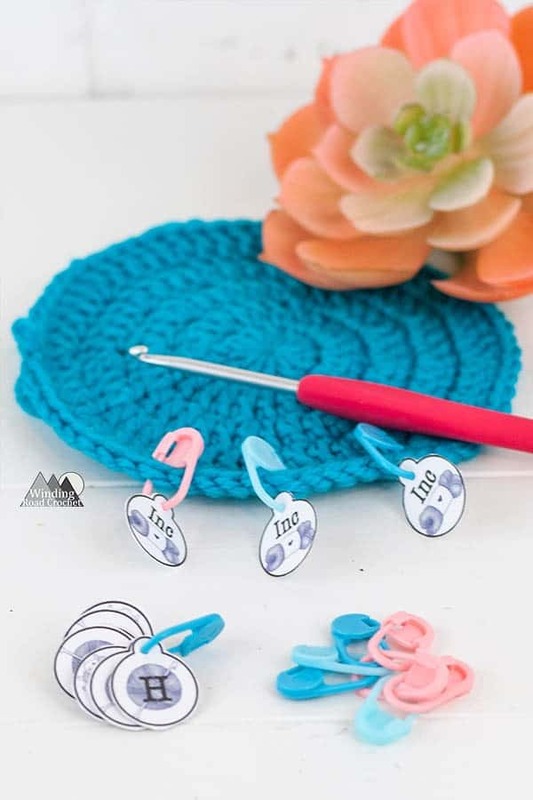 In this post you will learn how to use stitch marker in crochet to make your project go smoother and to save you time. Plus I will tell you how you can get my printable Stitch Marker Tags to make your stitch markers even more useful. shown in the photos. These stitch markers are inexpensive. I tend to lose them so, I bought a pack of 240 on Amazon and now I do not need to worry if one goes missing. , I highly recommend it. I can order something and most items will be on my door step in two days. you can use it with my Printable Stitch Marker Tags. , then I am sure you have experienced what happens when you hook falls out of your project and it starts to unravel. This experience can be easily avoided by simply removing your hook and putting it somewhere safe and placing a stitch marker in the loop where you hook was. Now your yarn can be pulled on and your project will not unravel. You can find beautiful stitch markers on Etsy that will have a bead with a Letter to indicate what size hook you were using. Since I tend to lose my stitch markers I prefer to use my Stitch Marker Tags to do the exact same thing. The Printable Stitch Marker Tags are available on my Printable Resource Page that is accessible to my Newsletter Subscribers. If you are a Subscriber, just got to any newsletter email and look for the link and password at the bottom of the email. If you are not an Subscriber you can sign up below and get access to all my Printable Resources as well as be notified of new free crochet pattern releases. It is free and you can unsubscribe at anytime. One of the worse things that can happen when crocheting is losing count. Be it a 120 long starting chain or simple having to repeat the same row 10 times. Someone is waiting to talk to you as soon as you get to the middle of your count. You can use stitch markers to marker every 10th chain to help you keep count, or mark the first row in a set of repeats. If you love to crochet check out all my Free Crochet Patterns and some of my favorites below. When you are working in continuous rounds it is important to mark you first or last stitch. This will let you know when your repeats will change or simply when you are on the next row. Use a stitch marker or a piece of contrasting yarn to mark this stitch. Now I confess the photo below is a little extreme. I would not mark an increase if you are increasing every 5 stitches, but if you are working on a dress or larger garment, the Emma Dress, you may need to increase every 20 stitches and pre-counting your stitches and mark where you will increase can save you a lot of time. If someone speaks to you while you are crocheting, you can just keep crocheting until you reach your stitch marker and make an increase. No need to worry about loosing count. If you are making an amigurumi or stuffed animal like my little Garden Gnome (pattern will be released this Friday) or if you are sewing a garment together like my Tunic Tee, you can use stitch markers to hold the pieces in place while you sew. This way you can make sure the arms are at the same height on a stuff animal. You can also make sure you edges line up on a sweater. As I have said, I tend to loose my stitch markers. So to keep these tiny little tools safe, I hook all the stitch markers on to one stitch marker. I do the same with my Stitch Marker Tags. This makes the small stitch markers just a bit bigger and harder to loose. Is there any other ways that you use your stitch markers? What is your favorite type of stitch marker? Let me know in the comments below. Written pattern, tutorials, graphs and pdfs of the How to Use Stitch Markers in Crochet are copyright Windingroadcrochet.com. Please do not reprint or repost this content as your own, but please feel free to share this link with others. You can find more information on sharing my work with others in the Terms and Conditions Page. These little tabs are a fantastic idea! Thank You! I use the plastic locking for just about everything. I also like the lobster claws that I’ve added a bead or charm to, for holding my last stich. Gotta love a little bling! teehee!